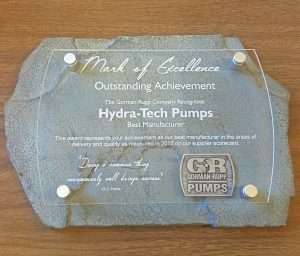 Manufacturer of the Year – Hydra-Tech Pumps, proudly recognizes the efforts of all of its employees for the contributions made which have enabled us to be recognized as the Manufacturer of the Year by Gorman-Rupp Pumps. The award comes to us as a long time GR vendor and participant in the Supplier Scorecard evaluation program that Gorman Rupp has been using since 2006. Pre-dating the Supplier Scorecard, Hydra-Tech’s relationship with GR goes back to the mid 90’s. 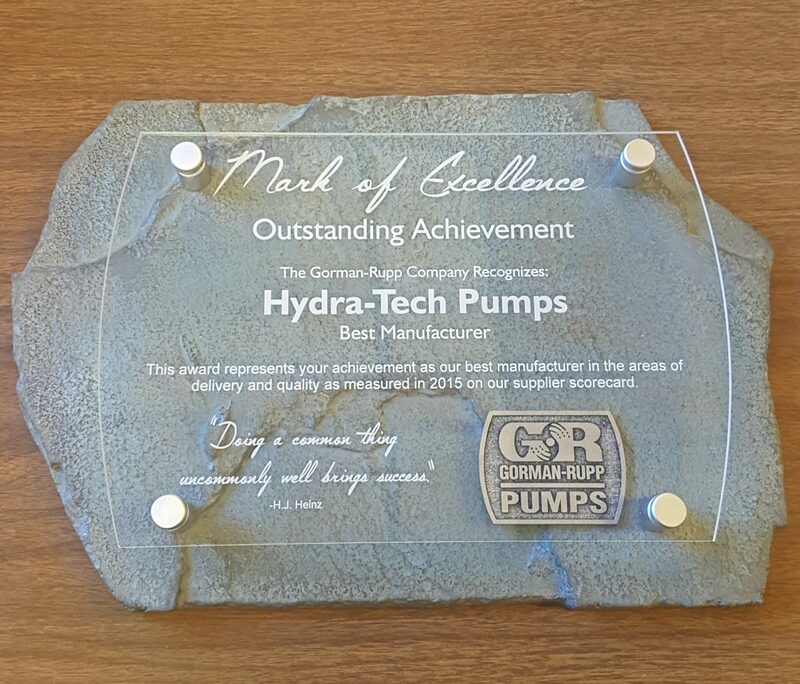 During that time period Gorman-Rupp recognized that Hydra-Tech’s USA made products offered both the best value and the best technology in the world of submersible pumps driven by hydraulic power. With that in mind, they invited Ken and his partner to Mansfield, Ohio to help create the right product offerings for our joint customers. After some brief negotiation, a handshake deal was done, and Gorman’s hydraulically driven submersible pump and hydraulic power unit program was born. While G-R’s line of hydraulics are limited to three, four and six inch pumps along with the compatible power units, Hydra-Tech’s product line has grown to include pumps from two inch discharge up to 24” axial flow pumps. The GR hydraulic product line is manufactured in Pennsylvania by Hydra-Tech and in accordance with G-R’s quality standards. The equipment is private labeled and carries to market the distinct Gorman Rupp color scheme. In addition to the standard products, GR and HT have partnered on some custom projects, including sound attenuated auto-start systems employed in western Canada, small auto-start diesel packages in use in Mexico City and a pneumatically activated auto start system for use in a permanent industrial setting. We thank Gorman Rupp for the honor and want all of our client companies to understand that we work each and every day to be the Manufacture of the Year for each and every one of our valued customers.